And it’s done! 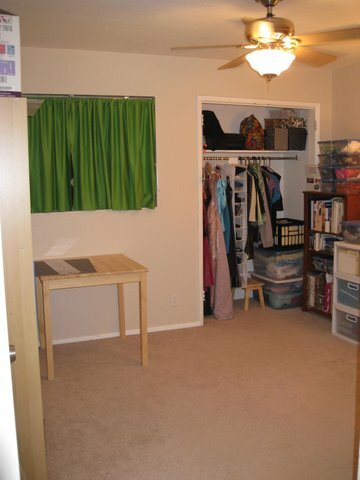 I finished my sewing room today, the last day of the 28 Day Organizing Challenge. The way it actually went down is that I finished because it’s the last day of the Challenge, and would have kept doing various things if there were more time. I like the results. 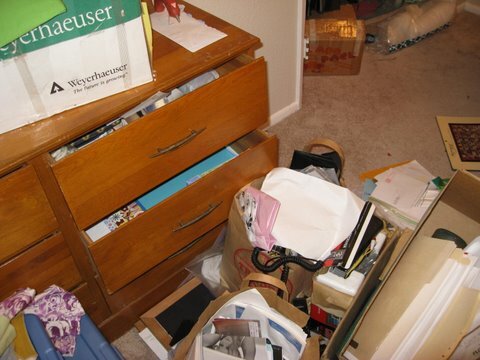 As my boyfriend said tonight when he helped me move out an old dresser: “There’s a floor in here? Huh, I hadn’t realized that…” And now for the pictures! They’re linked to slightly larger versions if you want to see more detail. The Before pictures are on the left and the After versions are on the right. Answers to the Challenge questionnaire are after the photos. 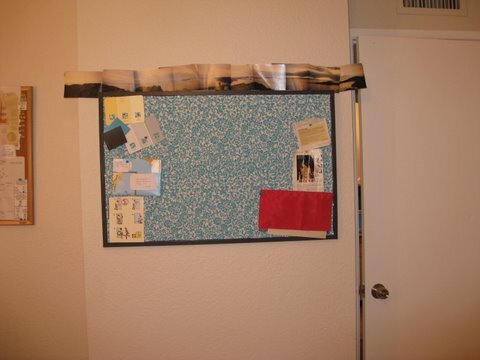 I also have a few pictures that don’t have Before shots for the comparison; they show my new bulletin board and sewing table accessories. The hardest parts of this challenge were emotional and mental rather than logistical. One of the hardest parts was just walking into the room to work on it. I’d be sitting on my laptop in the living room, reading the various internetz, and I’d say to myself, “Go work in your sewing room! You know you’ll like it!” Usually I didn’t do it. Whenever I finally did I was always glad, and tried to remember the feeling to encourage me to go the next time. I didn’t successfully overcome this difficulty. Another hard part was throwing away stuff that could maybe possibly be used in a theoretical future project perhaps. I didn’t like feeling wasteful, or like I was adding more garbage to the landfill. I overcame that by using a critical eye to realize that it was mostly garbage and didn’t deserve to be in a project. One last part that caused me trouble was when I would open a box of papers, notebooks, and pictures and find myself reliving years gone by. For example, I came across my journal from freshman year of college and when I opened it just to find a date to know where to put it, I got sucked into reading about falling in love with my best friend a semester before we got together. (He broke up with me a year later, and we stopped occasionally seeing one another a year and a half after that.) I decided I wasn’t prepared during this particular project timeline to delve that deeply into the emotional aspect of purging and organizing decade-old papers, so I grouped such items together by category knowing that at a later date I will go back and select which letters/notebooks/pictures/etc I want to actually keep and which can be reminisced about and then tossed. In the meantime, I simply organized these items into storage, purging some that were clearly trash. 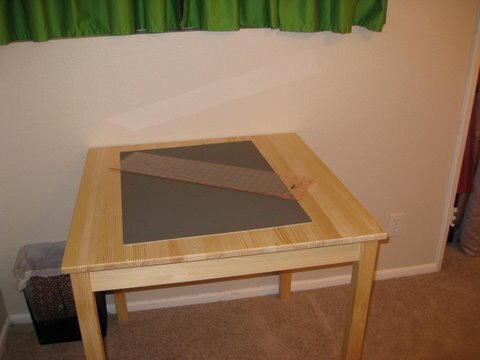 I added a small cutting table in place of the dresser to minimize the amount of in-progress fabric and projects that I used to work on the floor and to make to it difficult to stuff things away in a closed drawer and forget about them. There are now two small trash cans, one within reach of each main station in my sewing room. The large plastic bins in the closet are stacked with the least-used one on the bottom. A lot went into the garbage. The dresser moved to the guest room, lots of boxes of keepsakes were consolidated into much fewer boxes and stored in the spare room closet until I go through the papers individually to purge ones I don’t want to keep (see question 1 above), and some items moved to more appropriate permanent homes in other parts of the house. 4. 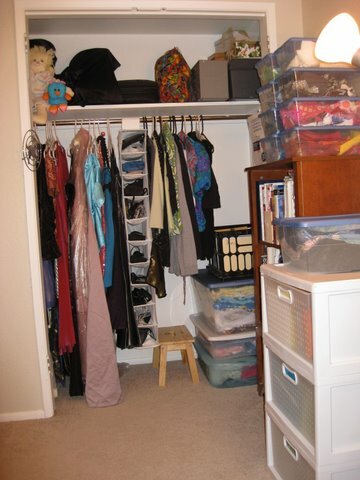 What creative storage solutions were you able to introduce in order to create additional space as well as establish some limits and boundaries? 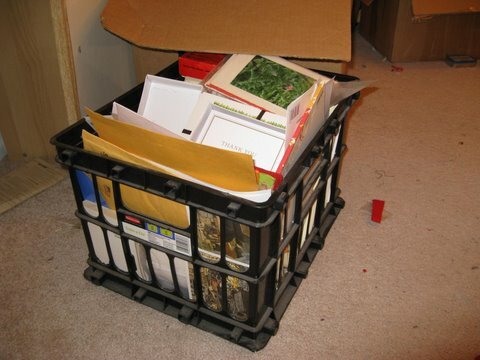 By consolidating multiple containers and boxes that weren’t even half-filled, I opened up more storage space. Other than that, I didn’t use a lot of creativity, it was more that I took the time to put things where I already knew they belonged. 5. Why do you think you should win this challenge? I’m not convinced I should win it, although that’s hard to say without seeing all the other participants’ results. 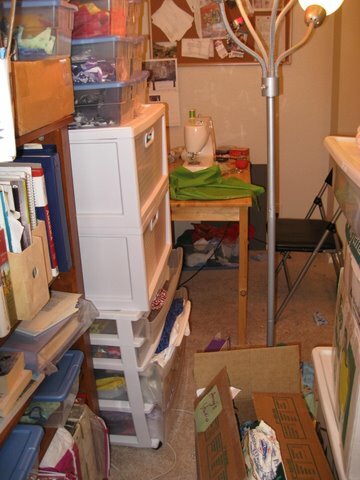 Despite the mess, my sewing room has always had the bones of good organizational structure. The Before and After shots aren’t extreme, and I didn’t so much implement many new organizing systems as I did enforce the existing ideas. 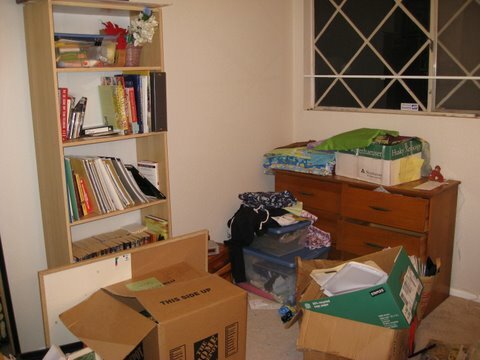 Also, I still have a few cardboard boxes of items to thoroughly sort and purge at a later date — notebooks, papers, folders, pictures, letters, notes,… They’re no longer in my sewing room, although they’re still out there. 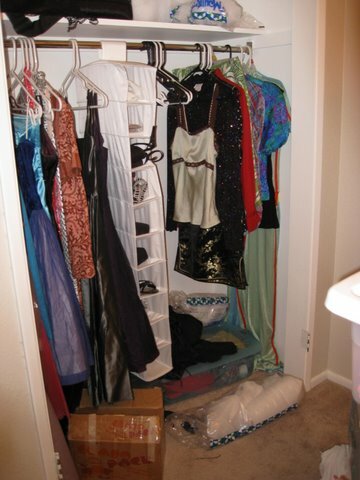 The left side of the closet is in fact prom dresses, cocktail dresses, and vintage gowns from the ’60s handed down from my mom. 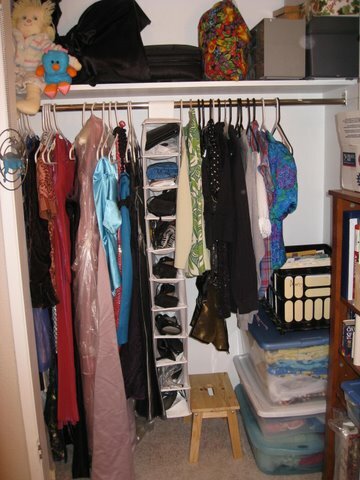 Other costumes and nostalgia-wear are in the bottom tub on the closet floor. The hanging dividers contain fancy shoes and purses. 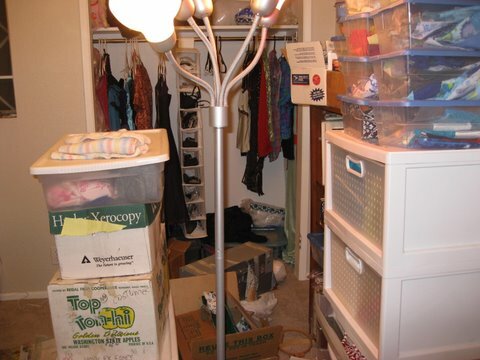 The clothes on the right side are waiting for alterations, tailoring, and refashions. Actual everyday clothes don’t live in my sewing room. The plastic basket on my sewing table corrals sewing tools like scissors, seam ripper, and pins, as well as some basic office supplies like tape, pens, and a scratch pad. I put a pretty note card box in the bottom of one half to raise the level enough so that the smaller items didn’t disappear in the bottom. It will also be able to store items when I find the need. It’s still empty as of yet because as I’ve learned, just because I have a container doesn’t mean I should put something in it. Let the contents determine the container and not vice versa. February 28, 2010. 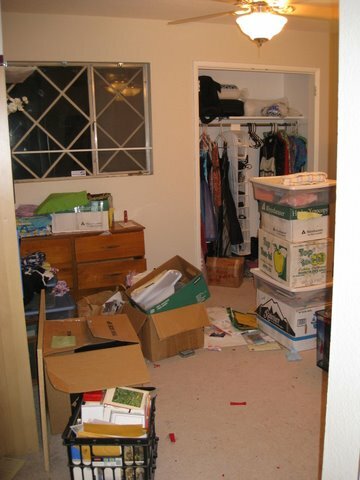 Tags: before & after, cleaning, organize, sewing room. Pictures, Projects, Words. 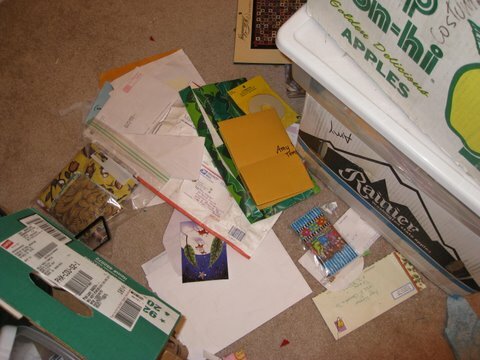 many crazy quilts over the years and most likely saved boxes and boxes of “scraps”. 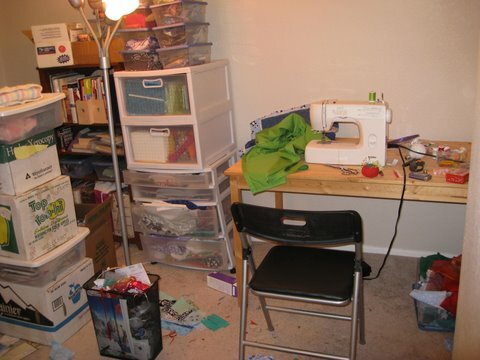 ….and…good luck keeping your sewing room as neat and organized as it is today. March 1, 2010 at 1:34 am. Permalink. Looks great Amy! I do have to say, the pink dress that I see peaking in your closet…is that a prom dress??? March 1, 2010 at 7:18 am. Permalink. Excellent job! 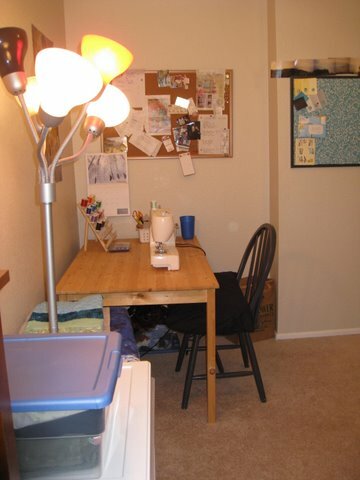 I want to do this again with my sewing room, even though it was done a year ago. 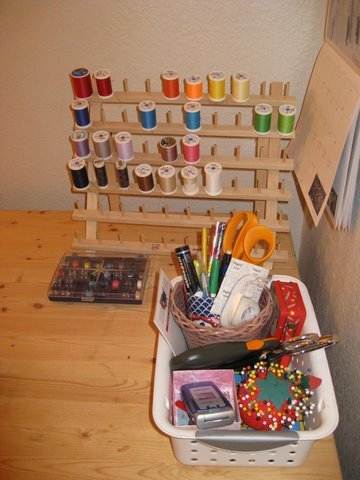 If you put your thread rack on the wall, you will free up a little more space on your sewing table. March 1, 2010 at 8:14 am. Permalink. Great job! 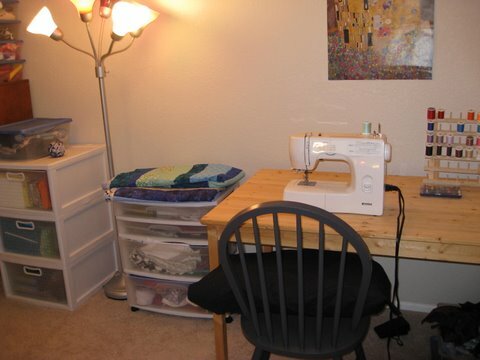 It looks like you have a ton of space to move around now and get sewing. March 1, 2010 at 8:39 am. Permalink. That must feel so much better. Great job! March 1, 2010 at 9:02 am. Permalink. March 1, 2010 at 9:23 am. Permalink. Reply to comment by Sandy…..who are you kidding?!?! 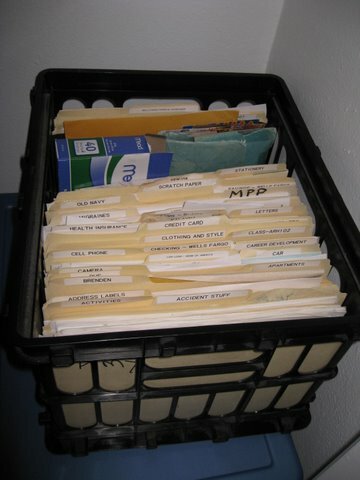 Amy- I think it is better to keep organization simple like you did, otherwise trying to keep up with some fancy system never lasts in the long run. March 1, 2010 at 2:58 pm. Permalink. I’m with you–mine wasn’t extreme either but that doesn’t mean it wasn’t a lot of work! 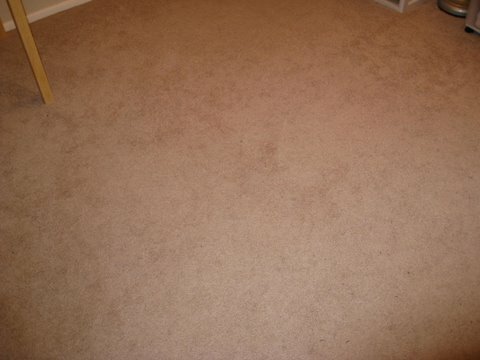 Great job–it looks very inviting and your hard work shows. Congratulations & enjoy! March 1, 2010 at 4:13 pm. Permalink. WOW! 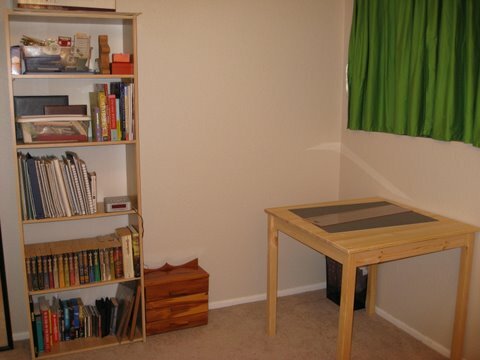 Without all that clutter you now have the breathing room to be creative in your space. Nice! March 1, 2010 at 7:01 pm. Permalink. good work! i hope you feel inspired in you ‘new’ space. i know i have a hard time going through ‘stuff’ that has been collected for future projects and then letting them go. ps; lol at the pic of the floor!! March 3, 2010 at 3:52 pm. Permalink. Great job! I just know this is going to be a wonderful creative space. March 6, 2010 at 6:59 pm. Permalink. May 17, 2010 at 11:13 pm. Permalink.